Determined and resilient, Reyna is a steadfast believer in the fruits of her labor; that for every trial she endures, another door will open and it is up to her to step through. She exudes strength when reflecting upon her past; its many twists and turns and life-altering challenges have only made her stronger. When she found out she had been accepted to Habitat’s affordable homeownership program, it was a welcoming sign that her perseverance was not in vain. She would finally have something she always dreamed of: owning a home of her own. 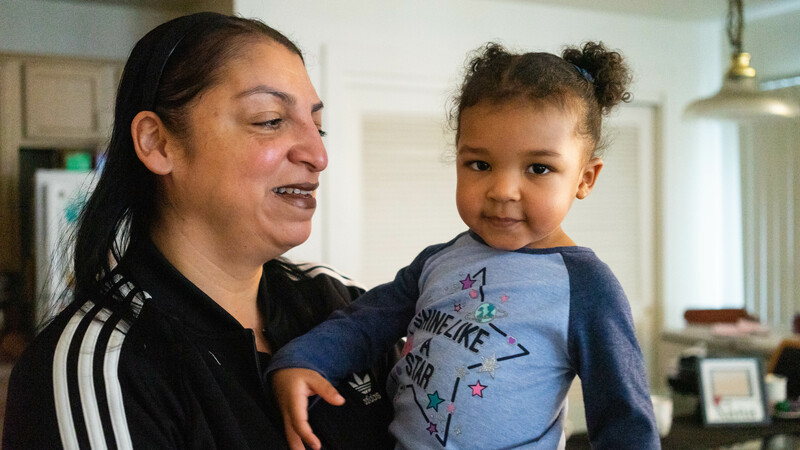 As a mother of three young women and grandmother of two granddaughters, Reyna’s apartment in Northeast Portland has been a longstanding welcoming space for her entire family. She has lived there for nearly 15 years; her daughters’ old room is now a playroom for her granddaughters Zara and Iliana. Drawings by the seven-year-old Iliana decorate the walls, and family photo collages adorn the shelves in the living room. It’s a space holding many memories, but with her family now grown and embarking upon their own lives, a new door has been illuminated. Reyna’s life has been a testimony of what greatness can be delivered through incredible strength, determination, and patience. Having lost her entire family in a fatal car crash at the age of two, surviving significant childhood trauma, and battling health issues later in life, Reyna’s life has not been without hardship. Her journey has been fraught with life-altering challenges that have tested her faith, but she always felt the presence of someone watching out for her. At Mount Olivet Baptist Church, she shares her testimony to aid others in their journey, offers words of encouragement to patients at the hospital where she works, and gives thanks every day for the opportunity to spread joy. Being a homeowner has been a longtime goal for her, but it wasn’t until she reconnected with a childhood friend and Habitat homeowner, Vanessa, that Reyna decided to partner with Habitat to build and purchase her own home. And while the cost of living continued to rise, Reyna set out to lower her debt. Now, by the time she moves into her new house, she will be debt-free. When the day she receives the keys to her very own home in North Portland finally comes, it will give credence to her full life and lend ample stability to her future. Among the many titles she’s earned throughout her journey—a survivor, mother, and grandmother—she will soon add another important one: homeowner.